This authoritative book offers challenging yet accessible accounts of the major features of Barth's theological work, especially as it has become available through the publication of his collected works, and interacts with the best of contemporary Barth scholarship. 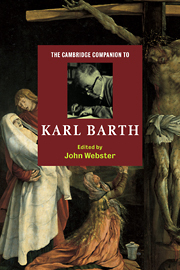 It assesses Barth's significance for contemporary constructive theology, and his place in the history of twentieth-century Christian thought. The Companion both sums up and extends recent renewed interest in Barth's theology, especially in English-speaking theology, and shows him to be once again a major voice in constructive theology. 1. Introducing Barth John Webster; 2. Theology Christoph Schwöbel; 3. Revelation Trevor Hart; 4. The Bible Francis Watson; 5. The Trinity Alan Torrance; 6. Grace and being: the role of God's gracious election in Karl Barth's Theological Ontology Bruce McCormack; 7. Creation and providence Kathryn Tanner; 8. Karl Barth's Christology: its basic Chalcedonian character George Hunsinger; 9. Salvation Colin Gunton; 10. The humanity of the human person in Karl Barth's anthropology Wolf Krötke; 11. The mediator of communion: Karl Barth's Doctrine of the Holy Spirit George Hunsinger; 12 Christian community, Baptism, and the Lord's Supper James J. Buckley; 13. Barth's Trinitarian Ethic Nigel Biggar; 14. Karl Barth and politics William Werpehowski; 15. Religion and the religions J. A. Di Noia OP; 16. Barth and Feminism Katherine Donderegger; 17. Barth, Modernity, and Postmodernity Graham Ward; 18. Karl Barth: a personal engagement Alasdair I. C. Heron.